*This trip is now finished! It is probably unwise to try to rewrite history, so why not check out our programme page instead? Sail Britain and An Lanntair are pleased to announce the ‘Muir is Tìr – Land and Sea’ residency will be running again in 2018. 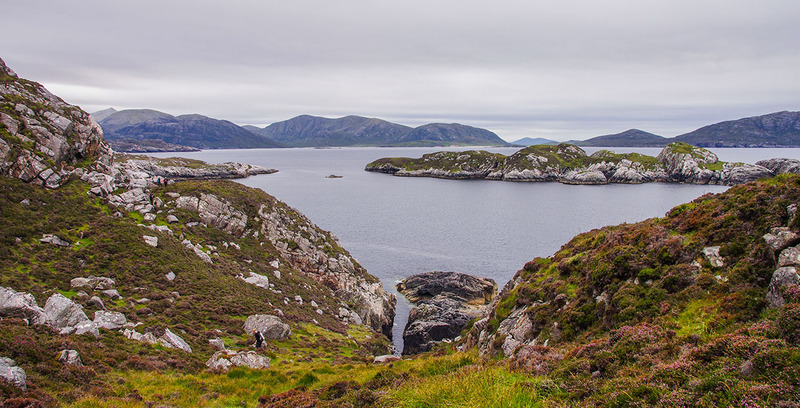 ‘Muir is Tìr’ is is a ten-day programme exploring the cultural heritage and identity of the Outer Hebrides, and the extraordinary beauty of the island landscape from land and sea. Muir is Tìr uses the land and seascapes of the Outer Hebrides as venue and research arena, offering a window into the language and culture of the islands through an involved and participatory approach. Half the residency will be spent on a sailing boat exploring the rugged coastline of the Isles, their stories, crafts and traditions. Working closely together while learning to sail will provide a different approach to exploring the coastline and islands, and allow time for reflection, observation and contemplation in a unique environment. The other half will be spent on land on the island of Bernerey, a remote and beautiful place with a fascinating history facing the expanse of the Atlantic Ocean. Participants will have time to develop ideas and material gathered during the voyage, or undertake further research or creative exploration. The resident artists’ work from the programme will form an exhibition at An Lanntair in Stornoway, and possibly other locations, dates TBC. Part of the residency will be spent living onboard a sailing boat. She is well equipped with comfortable berths, galley and heads (sea toilets) please see the Sail Britain FAQs on the website for further details about life onboard. For the part on land, there will be exclusive use of John’s Bunkhouse on Berneray. There is a contribution of £700 per person for the 10 days. This covers the yacht, crew, all food, fuel and harbour dues onboard the boat, as well as accommodation at the Bunkhouse when on land. The residency will begin in Lochmaddy on the Isle of North Uist on the evening of the 6th August. Lochmaddy is reached by the ferry from Uig on Skye, which in turn can be reached by coach or coach/train from Glasgow. It is a long but extremely scenic journey. The residency will finish in Stornoway on the 16th June which has ferry connections to Ullapool and onward via Inverness. 2. 6 images or sound or video files of previous work JPEG or PDF Images, preferably no more than 1080 pixels along the longest side. Video formats accepted include: .avi/.wmv/ .mov/ .mpeg/ .mpeg2/ .mpeg4. Alternatively these may be submitted as a link to Vimeo/YouTube, etc. 4. The successful applicants’ work will form a new exhibition at An Lanntair for the community at a date to be confirmed. This is to be arranged between the residency organisers and the successful applicants. A panel from An Lanntair and Sail Britain will select the successful applicants. All applicants will receive a reply within 3 days of the decision deadline.